As I embarked on my path to become a Mechanical Engineer (ME) at the Pennsylvania State University, I faced enormous financial and academic challenges. Being a first-generation student, I would come across situations that were foreign to me and my family. I completed the majority of my secondary education in the city of Philadelphia, but actually graduated from a high school in my natal Colombia. 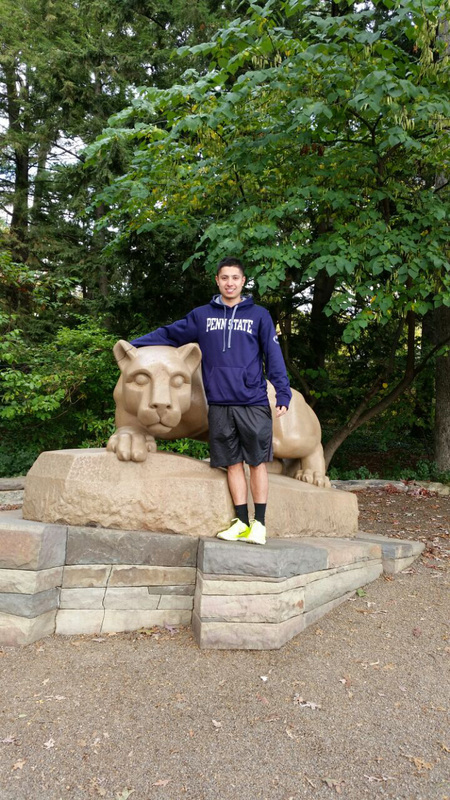 Because of this experience, my diversity would be a key factor in guiding me to achieve success at the Penn State. I completed the first two years of my degree at Penn State Abington, a small Commonwealth Campus in the outskirts of Philadelphia. There, I encountered my first obstacle: ensuring my enrollment in the controlled ME major while working a 40-hour-per-week job and a having a 45-minute commute. To add to the adversity of my situation, I unfortunately had only obtained a cumulative GPA of 2.6 in my first year, which fell short of the 3.0 Entrance to Major Requirement. The situation seemed very hopeless. I was discouraged because I had finished my freshman year with low grades and without even completing a calculus class. Edwin Giraldo feels fortunate to attend a college that challenges him inside and outside of the classroom. As it turns out, I faced a sophomore semester with the most difficult classes an underclassman can encounter. Fortunately for me I was truly attending one of the best schools in the world, where I was provided with the necessary resources to excel in my education. Coalescing this amazing initiative with my work ethic, balance of time, and attitude to learn, I was able to stand out in every single one of my classes, achieve Dean’s list in a crucial time, and enroll in the ME major. Even though the road wasn’t close to being over, I realized that I surpassed an important hurdle and most importantly I began believing in myself! I made the difficult transition from a campus of nearly 3,400 students to University Park, consisting of more than 40,000. This meant that I would have to leave the city of Philadelphia and take my first in-major classes in a place that was completely new to me. At this time in my career, I didn’t want change since I just found a method where sowing hard work reaped good grades at my branch campus. I felt relevant in my campus and achieved a first-name basis with my professors. In reality, I was afraid of what the change could bring not only to my ME career but also to my life. It turns out that the transition was extremely challenging and brought forth many unexpected obstacles. All of the students that were already at University Park possessed a colossal advantage over the students who were just arriving, like myself. I truly felt like a freshman all over again, but even worst I faced in-major classes and was expected to have all of the knowledge that my peers possessed. The students that attended University Park throughout their undergraduate career also seemed to share a distinct similarity; for the most part they had all completed an internship or Co-Op in their respective fields. Nonetheless, I found the silver lining and came to the realization that I was also a Penn State student. I looked at the positive aspect of the situation and kept my Abington peers close and managed to schedule classes together and work strategically as a team. I was also very fortunate to come across many organizations, like the Society of Hispanic Professional Engineers, that bring together engineers who share similar backgrounds or career objectives. One of the most important organizations that I am fortunate to be a leader for is ChangeUP, which is a group that helps ease the transition for transfer engineering students. Overall, I received a lot of resources that aided the transition to the University Park campus. At the end of my first semester at University Park, I received an offer for a Co-Op that would allow me to obtain my very first experience as an engineer. I believe that as an engineer you face challenges on a daily basis. It is the effort and the time that you place in addressing these obstacles that lead to success. I feel very fortunate to attend a school that challenges me not only academically, but also outside of the classroom, where I am a part of student organizations which integrate engineers from all backgrounds to become completely prepared to succeed in their fields, while giving back to the community. Finally as I currently stand facing my senior year classes and interviewing for full-time positions, I hope to be an inspiration to first-generation students and minorities struggling to better themselves through an engineering degree! Edwin Giraldo is a senior majoring in mechanical engineering with a minor in engineering leadership development. He hopes to work as a process engineer, complete a master’s degree, and never stop learning. Edwin serves as president of the Colombian American Student Association and leader/treasurer of ChangeUP, and is active in the Society of Hispanic Professional Engineers and the Multicultural Engineering Program. The Manizales, Colombia, native enjoys watching and playing soccer, dancing salsa, spending time with family, and serving his community.